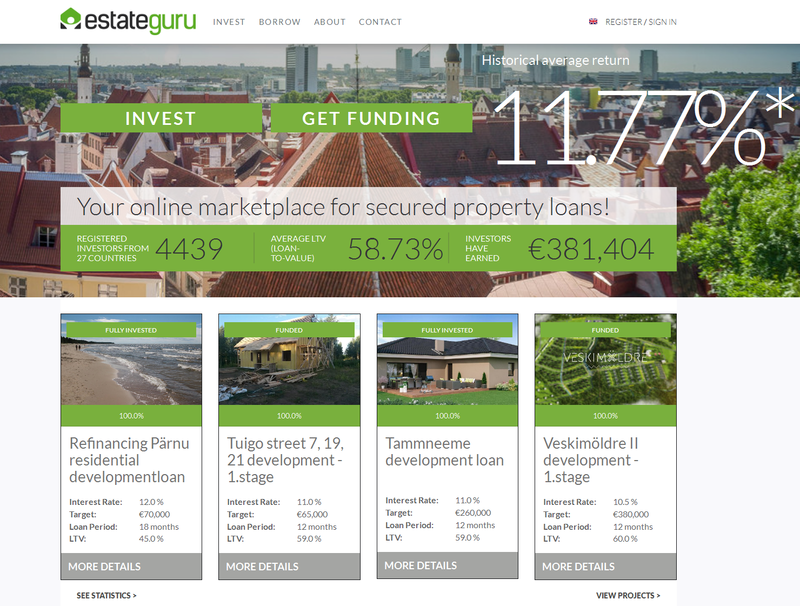 Estateguru is a p2p lending marketplace in Estonia focussed on bridge loans to property developers in Estonia. Since the launch in 2014 Estateguru has facilitated a loan volume of more than 10 million Euro in a total of 65 loans. The loans are secured by 1st or 2nd rank mortgages. Typical interest rates range from about 9% to about 12%. Some of the loans pay monthly interest, while for others the interest is paid at the end of the loan term. The minimum bid amount is 50 Euro. Estateguru provides appraisal reports for the security. 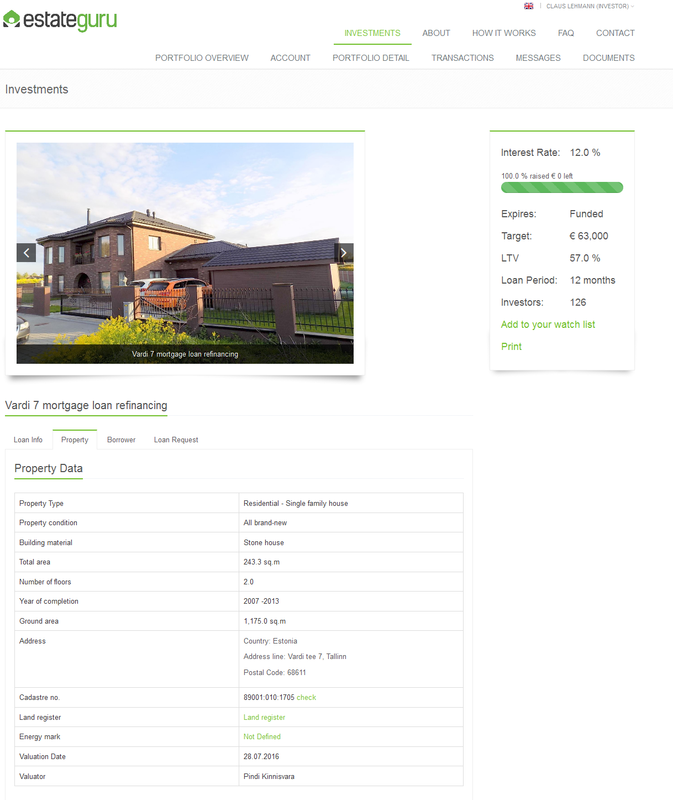 Estonia is highly advanced in digitization – this allows Estateguru to provide direct links to the official records in the land register for the plot. I have invested in a couple of loans over the past years and the handling is smooth. Two loans are repaid (one early) and the other loans are running on schedule. Other investors report that there have been no defaults yet, only some loans where the payment came in late for a couple of days (or a few weeks at max.). Unlike other platforms, Estateguru sends no updates about the loans. Many investors keep some cash in the Estateguru account in order not to miss out, when new loans appear. Smaller new loans usually fill within hours. Investors can opt for a notification email, that is sent when new loans arrive. However tiny loans (< 40,000 EUR) are sometimes 100% funded by the time the email arrives. There is no autoinvestment feature / prefunding facility. Estateguru does not have a secondary market, but many loans are only for 12 or 18 months term. Estateguru is open for investors from all over Europe (actually the EEA). If you are inside the Eurozone investments are fast via SEPA transfers. If you live outside you should consider using Transferwise or Currencyfair to avoid high bank fees and get a better currency exchange rate. Bonus: If you sign up using this link Estateguru will credit you 0.5% cashback on all investments you make in the first 90 days. Thanks for post I got question are the loans secured or is there any buyback ? what happend if the loan is in the default ? How long should I wait for my invested money? as described all loans are secured by property. There is no buyback. So far there have been no defaults, but you should with this kind of investment fully expect some defaults to happen, therefore the valuation of the security and the LTV are important. EstateGuru has been part of my P2P portfolio for 1y and a half. Invested in about 20 loans and everything is running smoothly. Yes, there are some things that need to be upgraded and some features that should be included, but overall I’m quite satisfied. You pointed out that Estonia is a highly digitalized country. Sadly, my mind goes to my country, Italy, where the existence of such a platform won’t be possible in the near future.